Halting security coordination with Israel will only harm the PA, MKs say Wednesday. Public officials have reacted to the Palestinian Authority's (PA) decision to suspend security coordination with Israel Wednesday, after senior PA official Ziad Abu Ein died during clashes with the IDF after refusing medical treatment from soldiers. 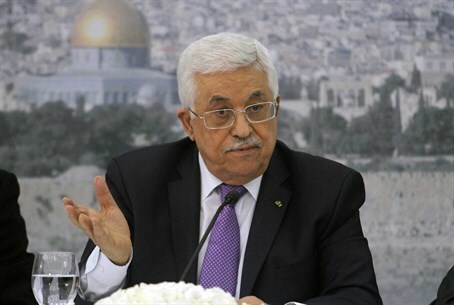 Criticism has been directed squarely at PA Chairman Mahmoud Abbas for the move, which was taken on his orders. "Abbas is the problem, not the solution," MK Orit Struk (Jewish Home) and MK Yariv Levin (Likud), Chairman of the Land of Israel Caucus in the Knesset, released in a joint statement Wednesday afternoon. "Whoever funded a terrorist by making him a minister, and then sends salaries to terrorists to confront [IDF] soldiers can only blame himself." Both said that Abbas is conveniently forgetting that the IDF and Israel Security Agency (ISA or Shin Bet) is the sole protection Abbas has from Hamas. A major coup against Abbas was busted by Israel in August. "If he wants to cut off the branch he sits on with his own hand, and be expelled from the PA as he was expelled from Gaza - Israel knows how to take its security into its own hands, without their dubious level of assistance." Arab media claims Abu Ein died after being "beaten" by IDF soldiers, but footage from the event just hours ago proves that he remained untouched during his heart attack - and refused IDF assistance that could have been life-saving. Abu Ein previously held the post of PA Deputy Minister of Prisoners' Affairs. Despite this, leftist MKs still blamed the IDF for the encounter. "This is not the first time a Palestinian participant in a civilian demonstration pays for it, wrongly, with his life," Meretz MK Michal Rozin claimed. "Perhaps because of his senior position, this last casualty will make Israel finally responsible, and it will be required to take steps to investigate the cases and prevent unnecessary killings in the future." "I call on the Prime Minister to deal with the matter urgently, and the IDF to conclude the investigation as soon as possible," Rozin continued. "There is no doubt that the event today is a wake-up call - we need urgently to make an accounting of the IDF's actions, both within the Green Line [1949 Armistice lines - ed.] and outside of it."